From the back cover: This book was written to help children who face orthopaedic surgery. Bo the Bear has surgery and helps prepare a child for each step of what to expect, from the ride to the hospital to the ride home. 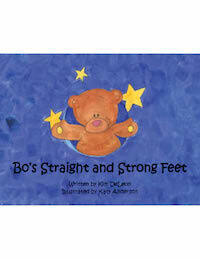 "Bo's Straight & Strong Feet" is the second book about Bo the Bear. In "Bo's Cherub Feet", Bo faces weekly casting to correct his clubfeet with the Ponseti Method. Author Kim DeLeon has a passion for comforting children through challenges in life. For more information, please contact the author directly at bobearbook@yahoo.com. Illustrated by Katy Anderson. Romanian translation by Daniela Oancea.